Stir chicken, bacon, tomato, and celery together in a bowl. Whisk mayonnaise, parsley, green onions, lemon juice, Worcestershire sauce, salt, and black pepper together in a bowl until dressing is smooth. Pour dressing over chicken mixture; toss to coat. Refrigerate until chilled, at least 30 minutes. 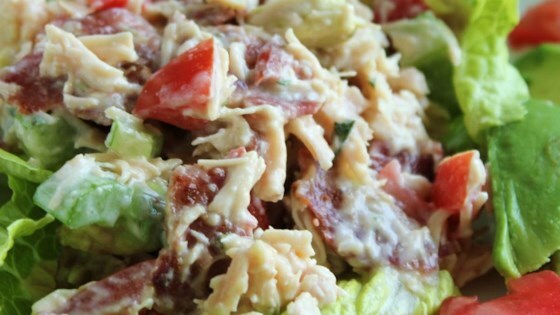 Stir chicken mixture and serve over romaine lettuce leaves; garnish with avocado slices. this was so so good. I made tortillas and assembled everything as a wrap.....a great summer dinner item. Husband loves it. Thanks. This a great receipe! I served this for lunch to a few friends, and they wanted the receipe. Wonderful taste, instead of pork bacon, I used turkey, and it turned out great. Great job!